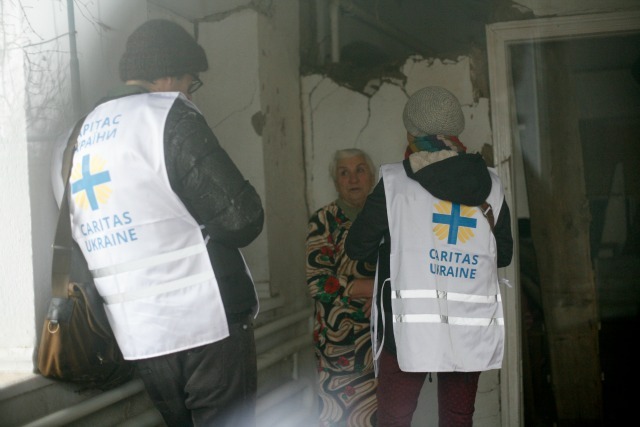 Caritas is appealing for support for Ukraine to help people caught in conflict get through the winter. The appeal for Euros 1.5 million will focus on shelter, winterisation, counselling and access to basic health services. The aid will reach over 17,000 people, mostly concentrated in eastern Ukraine and especially for people living along the frontline or ‘Buffer Zone’ between government and rebel forces. Fighting between pro-Russian separatists and Ukrainian forces started in April 2014, and has forced over 2.3 million people to flee their homes, 1.5 million of whom remain within Ukraine. Money has run out for many of those who have left their homes or are unable to find work as a result of the war and the economic crisis. A Caritas survey of families in the Buffer Zone found that expenses were four times higher than income for basic daily life. Along the Buffer Zone, Caritas will provide shelter kits and cash for work to repair homes, deliver fuel such as briquettes and wood, and stoves and will improve access to health services through the distribution of medical kits, as well as the provision of medical check-ups through local doctors from local health units or hospitals. Elsewhere, Caritas will support the winterisation of homes and counseling to those displaced by the conflict. “In Ukraine, people try to support each other, but we don’t have the means. The government doesn’t have the means either. That’s why need help from outside to be able to provide humanitarian aid,” said Andrij Waskowycz.